As bloggers, I believe most of us are quite structured in our daily approach to writing; at least we try to be. The weekly photo challenge asks us to share images that show Structure of something typically overlooked. This past summer, as I enjoyed a day on the beach where we windsurf, I had the chance to photograph something amazing! 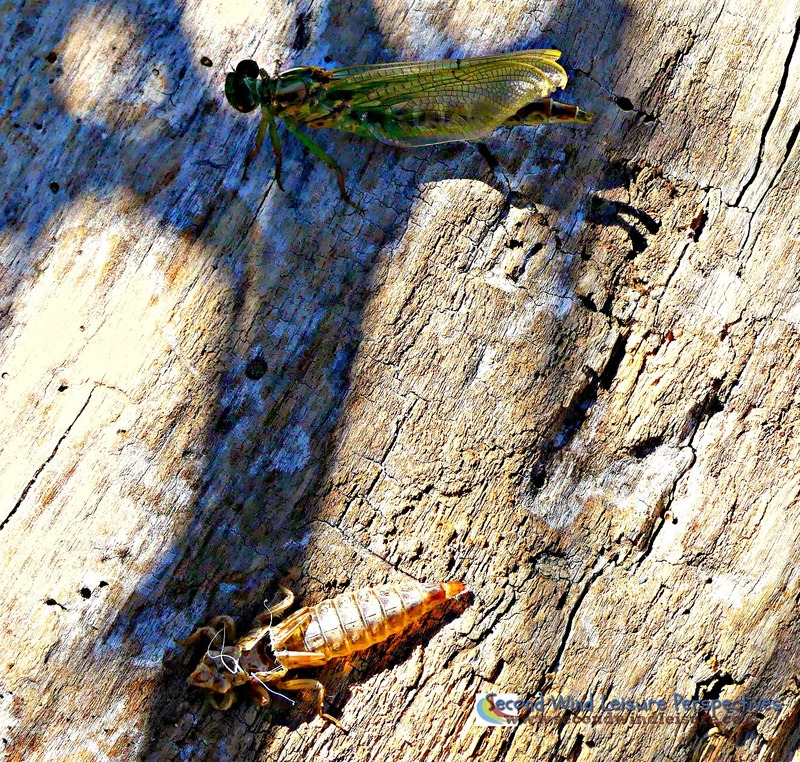 In the wooded area less than a foot behind our beach chairs, a dragonfly nymph found a safe place to shed its exoskeleton and enter into adulthood. 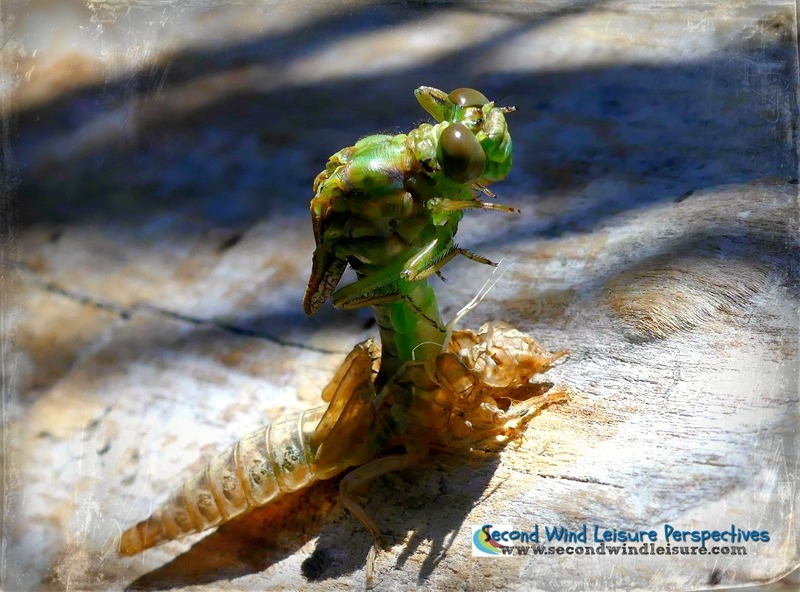 Even in the strong breeze, this smart little fellow stuck like glue onto the log as he emerged from the structure of his previous skin. The breeze blew his now dried exoskeleton further from him. It was amazing to sit and just watch this phenomenon of nature, while he seemed content to dry his wings in the sun. The structures and cycles of nature are truly remarkable! 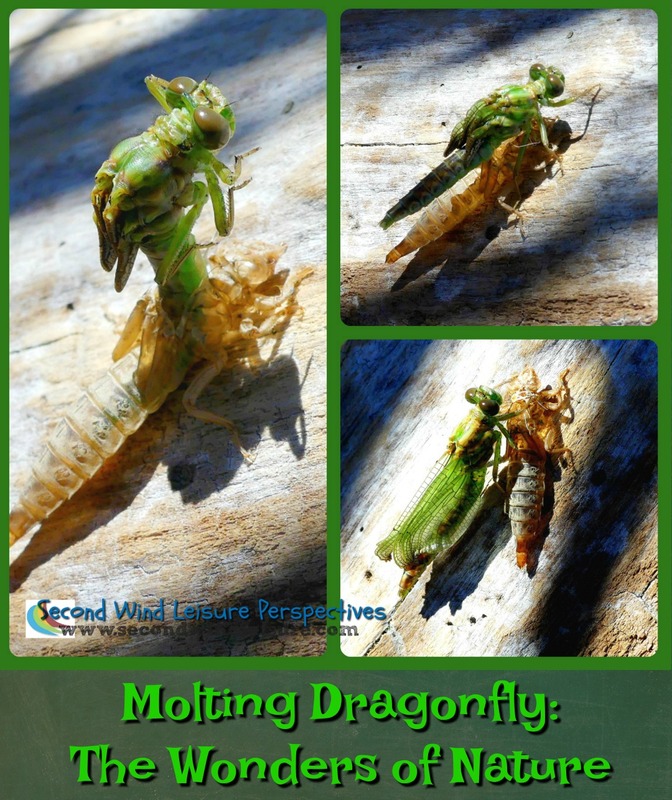 I wonder if we have the power to shed our old skin with the gracefulness and bravery of a dragonfly? Wow! Really enjoyed this post. So many (deep) meanings behind this post, Terri. Very thought-provoking! This was an amazing capture, Terri, and what a lucky shot. Thanks! They are amazing little creatures. What an extraordinary thing to have witness and photographed. Wonderful, Terri. Agree with everyone that these are amazing photos, Terri. Just think how it would be if humans had to go through the same process. I believe we’re shedding our skin all the time and, in fact, we’re cleaning it up when we dust or use the vacuum cleaner. I could go on, but I’d end up putting everyone off their breakfast, lunch/dinner, supper. Thanks, Hugh. We do shed our skin but not so gracefully, I’d say…thank goodness for vacuum cleaners. This is an amazing photo story! You were very patient, waiting for the entire episode. And what a result! Love this, just love it! Thanks, Sharon, I’m so happy it turned out! Thanks, Liesbet! It was amazing to watch! That would be something to shed skin, I think there was a sci-fi/horror movie about the subject, LOL! That is a remarkable photo Terri! Imagine being in the exact right place to cat that image. It is a great image to use to talk about transformation. Find a contest and enter it so you can win! I have never seen that kind of shot- not even in Nat. Geo! Oh! Well you are too kind, Michele! I was lucky but I was mesmerized, too. He was very brave sitting there while I took photos–got REALLY close! What an amazing process! 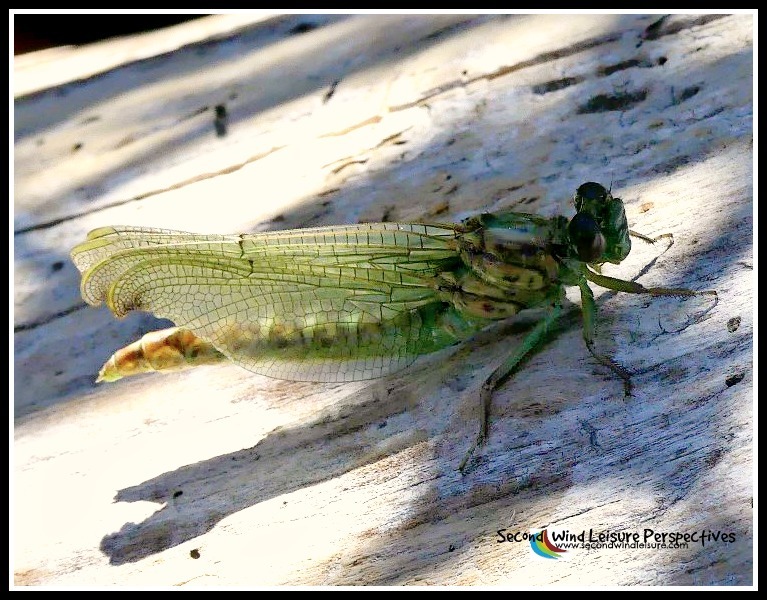 I have to say that I wouldn’t mind having the ability to shed old, dry, wrinkled skin as easily as the dragonfly 🙂. I love the delicate stained glass wings. Did you wait long enough to see him spread them and fly away? Never new dragonflies did this. Educational and beautiful. Great capture congratulations. Thanks, Carol! In the right place at the right time! They are amazing little critters, thanks, Denise! That is incredible that you were able to capture that moment, Terri!! It’s like what you’d see on the nature shows!! Thanks, Jodie, I was incredibly lucky!